This has been a good week, weatherwise and otherwise. We have gotten a new bedroom set for one thing. Well, we are still waiting for delivery of the chest of drawers which may take another two months. But meanwhile we have donated our old bedroom set (mostly from the 1970's--need I say it was really time for it to go?) to Oasis Ministries which was founded by the pastor who married Sweetface and me. Years ago he founded a St. Louis ministry for the immigrant population, most of whom arrive here with nothing at all. It felt good to know that our still in good condition furniture was going to be a blessing to someone else. And we are really enjoying the new set. I decided to splurge on it after having a couple of record-breaking months of sales in my Ebay store, and I'm glad I did. It was also on sale, which made me take the big leap. Funny thing, last night Becky wound up having to sleep at our house after getting home from work to find she had no water due to a septic blockage. So we had an impromptu pajama party, and she even posed for a photo. She said, "This had better not go viral!" Ha! The weather has also been wonderful. Yesterday Sweetface and I took a walk at a newly opened park nearby. It was well into the 70's and sunny most of the day. I'm glad we have enjoyed our good weather lately because right now the sun is losing it's struggle to stay out as clouds approach. We are supposed to have nothing but clouds and rain for the next several days. Such is spring. I am just glad we live here rather than in Seattle; I need sunshine for energy. Constant rain puts me to sleep. I hope you are having a good week. What have you been up to? I'd love to hear from you! And they are so snuggly! Hi Linda. I love that photo of the Icelandic Sheep. What a perfect addition to the bedroom. Love, love, love it. Congrats on the new furniture. It looks great! You have such a good eye for 'pretty'. 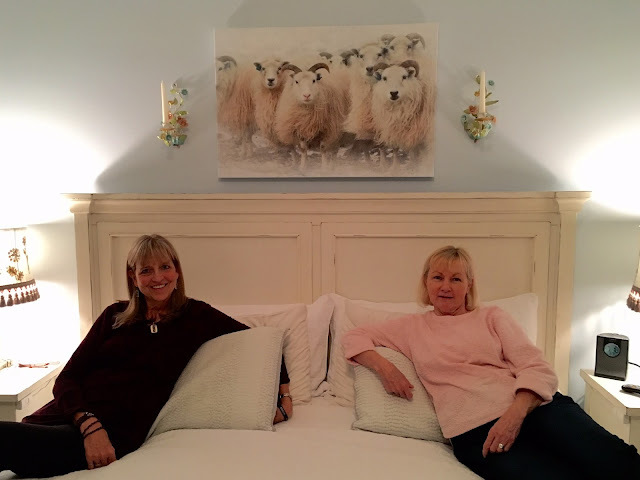 I love your new bedroom set and LOVE the sheep picture! Neat trick on the earrings. Oh my goodness; I just visited your friend's photo website.... AMAZING photo's! She is an AMAZING photographer, indeed. Hi Linda! Thanks for visiting my blog and introducing yourself. My, I LOVE the sheep photo. I'm actually quite envious. LOL! She's a wonderful photographer, and those sheep are divine. I also want to compliment you on your floral displays - sublime. I adore flowers and plants in the house. Hi, Jenny of Australia! I am so glad you like the sheep and the flowers. I can't imagine the plant life you have in the tropics--it looks fabulous. I look forward to following your cheery blog!